Blog for MATLAB® users interested in algorithmic trading strategies, backtesting, pairs trading, statistical arbitrage etc. In this post, in continuation of Part 1, I will try to describe the most common problems which occur while testing algorithmic trading strategies in MATLAB when using one's own groundwork or the code from the automated trading webinars. Let's start with the fact that there is no graphical interface because if we presume that almost the whole process of testing and analysing trading strategies is standardised (it is 99%), you would like to have the interface which helps you call up the necessary data and start the testing process with one click. For new (and not only) users of MATLAB it is much more convenient to use a GUI with buttons and entry fields than to search in the code; therefore, there is a GUI even in the MathWorks Toolboxes in most cases because it is more convenient. It allows focusing only on the code of your strategy because use of a GUI does not at all imply that it somehow limits your ability to write a strategy. 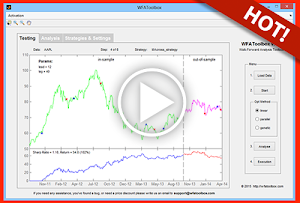 Thus, in WFAToolbox, we created a possibility to write any codes for your strategy, using any of MATLAB toolboxes and working with multiple assets for the strategies such as pairs trading, basket trading or triplet arbitrage, etc. ; but at the same time this code is easily integrated in the GUI by use of patterns, which are simple enough to apply in the code and they do not limit opportunities. In order to easily master the patterns of code to create your strategies, not only we created detailed WFAToolbox Documentation, but also WFAToolbox Video Tutorial, which provides an opportunity to a full-scale work with the app in a few minutes. MATLAB Add-on for Developing Algorithmic Trading Strategies in MATLAB the easy way. Whoa?! What happened with the blog? MatlabTrading. Theme images by gaffera. Powered by Blogger.